President Donald Trump threatened more levies against China on Thursday, stating that he has asked the United States Trade Representative to consider $100 billion in additional tariffs against China. Boeing and Caterpillar, two companies that could be adversely affected by a trade war with China, both fell more than 3 percent. Stocks fell sharply on Friday as worries of a trade war brewing between the U.S. and China grew. Wall Street also digested disappointing employment data. The Dow Jones industrial average fell 572.46 points to 23,932.76, closing back in correction. Boeing and Caterpillar were the biggest decliners in the 30-stock index. The S&P 500 declined 2.2 percent to 2,604.47, with industrials as the worst-performing sector. The Nasdaq composite dropped 2.3 percent to close at 6,915.11. 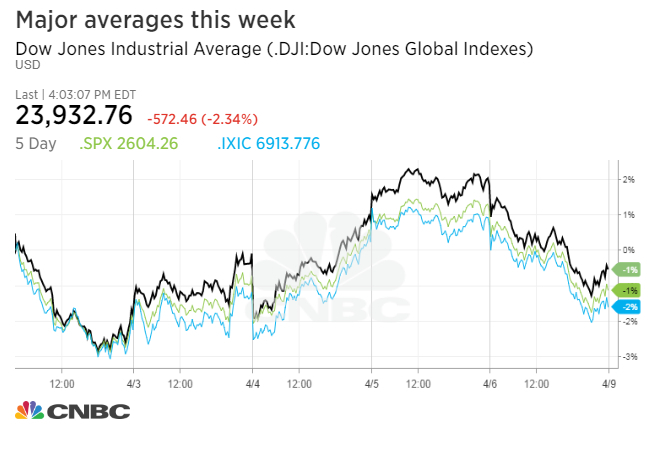 Equities hit their session lows in the final two hours of trading — with the Dow falling as much as 767.02 points — after Fed Chief Jerome Powell indicated the central bank would continue hiking rates this year. Some traders were hoping the Fed Chief would acknowledge the recent market volatility caused by the trade dispute. For the week, the major averages closed lower as volatile trading persisted. The Dow and S&P 500 declined 0.7 percent and 1.4 percent this week, respectively. The Nasdaq composite dropped 2.1 percent. "This is truly a reaction to China," said JJ Kinahan, chief market strategist at TD Ameritrade. "What we've seen with this administration is a trend of a big statement, followed by everyone getting riled up, and then a pragmatic solution is found." "Cooler heads may prevail moving forward," Kinahan said. After China announced fresh tariffs on 106 U.S. products Wednesday, President Donald Trump threatened more levies Thursday evening, stating that he has asked the United States Trade Representative to consider $100 billion in additional tariffs against China. U.S. stock futures plunged overnight on the news, while global stock markets fell. China's Commerce Ministry said Friday the country will not hesitate to react with a "major response" to the new tariffs from the U.S.
Trump later tweeted on Friday: "China, which is a great economic power, is considered a Developing Nation within the World Trade Organization. They therefore get tremendous perks and advantages, especially over the U.S. Does anybody think this is fair. We were badly represented. The WTO is unfair to U.S."
Shares of large-cap tech companies also fell. Amazon dropped 3.2 percent while Apple fell 2.6 percent. Netflix dropped 1.7 percent after briefly trading higher. Stocks briefly came off their lows in midday trading after an official from Mexico's economic ministry said the person was "very convinced" a new deal on NAFTA will be reached soon. But the major indexes resumed their decline after Treasury Secretary Steven Mnuchin said there was a possibility of a trade war with China. "If this leads to more tariffs that's going to be hurtful to the economy," said Scott Clemons, chief investment strategist at Brown Brothers Harriman. The move lower in stocks also follows the release of much weaker-than-expected jobs data. The Labor Department reported the U.S. economy added 103,000 jobs in March. Economists polled by Reuters expected a gain of 193,000. "I'd call this one a mixed bag. The headline number may disappoint but there's more than meets the eye," said Mike Loewengart, vice president of investment strategy at E-Trade, noting that wages improved and unemployment remains at historically low levels. "For investors, today's report may be a tough one to swallow when coupled with a trade standoff that seems to be intensifying with each passing day," Loewengart said.